the trend follower: Learning from the Turtles experiment - what should you learn first? Learning from the Turtles experiment - what should you learn first? The ad that started a legend. An often overlooked aspect of the Turtle Traders experiment was not simply what they got told, but the order in what they got told. We can piece this together from the various writings about the experiment, including that of the Turtles themselves. 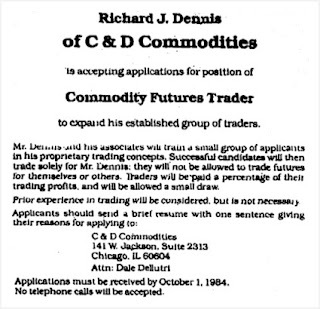 It is also known that, while a commodities trader, Richard Dennis preferred not to read economic or crop reports - his preferred reading was Psychology Today. So I think it would be fair to say that (whether it was directly done or not) there was some basic trading psychology covered during the training period. Now, it is my belief that risk management and psychology are closely intertwined - if you have your risk under control, it becomes far easier to keep on an even keel emotionally. If you trade using excessive risk, then it becomes far more difficult to avoid overriding your rules or second-guessing what may (or may not) happen in the markets. To me, the fact that risk management (and possibly psychology) were covered before entries and exits, was a key point of the training given to the Turtles, and something that all new traders should consider. More often than not, people new to the market focus all their attention on entries and exits - they want to find the holy grail of getting in at the beginning of every move, and getting out at the end of every move. And, as anyone who has been in the game for a while will know, that simply isn't possible. The Turtles were presented with a method that had an edge, and their task was to follow the rules - to concentrate on the process, rather than the outcome. The results would follow if they followed the rules. "I always say that you could publish my trading rules in the newspaper and no one would follow them. They key is consistency and discipline. Almost anybody can make up a list of rules that are 80% as good as what we taught our people. What they couldn't do is give them the confidence to stick to those rules even when things are going bad." People generally learn about risk management after they've been subjected to a big loss, or maybe even after blowing up an account. But the approach to risk was clearly given priority in the Turtles' training period. Of course, during this phase they also got involved in the famous heating oil trade, which helped to reinforce the need for discipline and the ability to follow the rules. You can read more on that here. 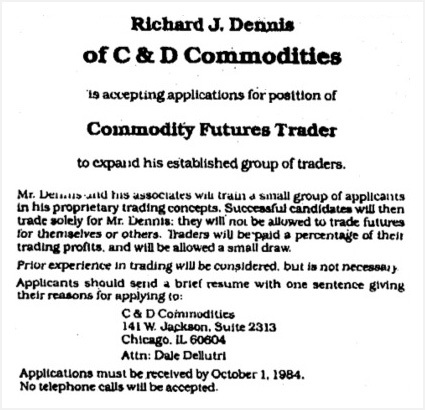 So in a very short space of time, they had been exposed to the need for trading discipline, together with having the risk and psychology elements spelt out to them. Given the performance of those who stayed the course, and their subsequent success after the Turtles disbanded, those early lessons clearly held them in good stead.